At Au Cinquième Péché, Chef Benoît Lenglet is certainly not one to shy away from dishes that might make some diners uncomfortable (like, for example, calf sweetbread, which is neither sweet nor bread, for those who are unfamiliar). 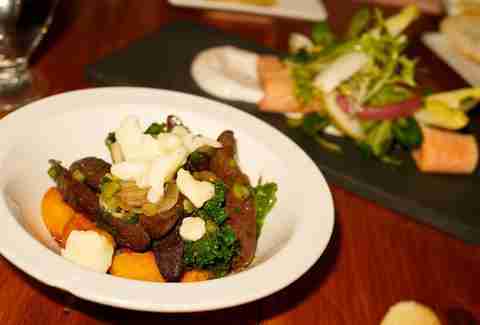 The restaurant receives seal meat in April after the legal hunting season, when it then serves its hugely popular and just a bit controversial seal merguez (sausage) poutine made with sweet potato gnocchi, Brussels sprouts, cheese curds, and au jus. Au Pied de Cochon is known for its sublime meat dishes prepared in a wood-fired oven. It is also known for serving lots and lots of foie gras. (Sooooooooo much foie.) 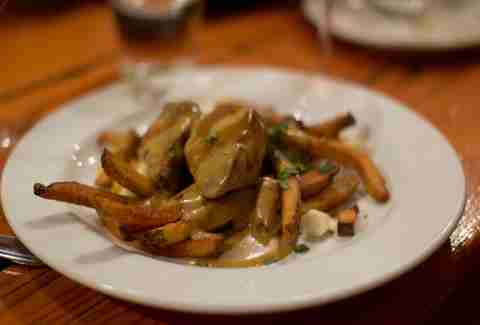 So naturally, foie gras poutine also made its way to the menu. 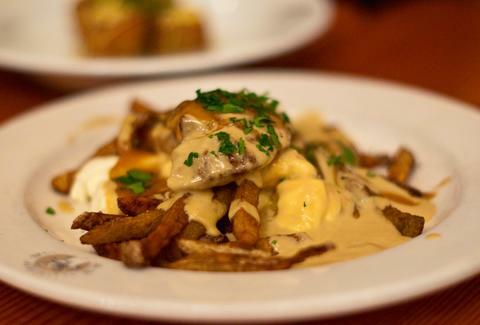 For those looking for a quick fix without the lengthy wait for reservations, there is the Au Pied de Cochon food truck, which also serves the famed poutine. 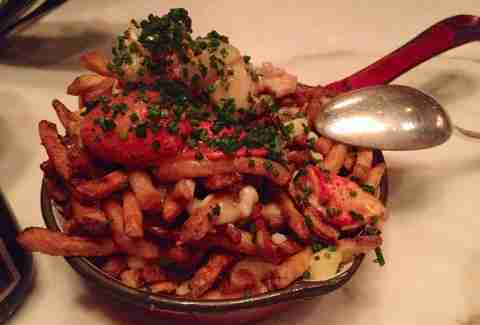 Canadian celebrity chef and Iron Chef America winner Chuck Hughes started serving his famous lobster poutine at Garde Manger, and carried it over to his newest Montreal spot Le Bremner. Loaded with large Canadian lobster chunks and smothered in a rich lobster bisque sauce, it's no wonder that this is the dish that led to Hughes beating out Bobby Flay in Iron Chef America. 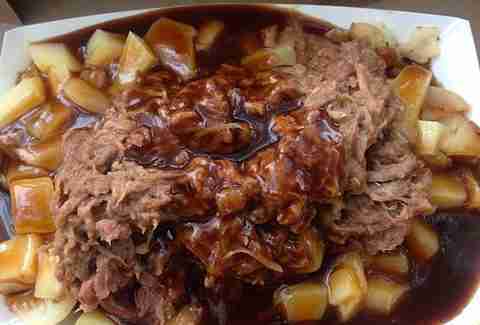 Make no mistake: if the animal is edible, it will end up on a poutine in Montreal. 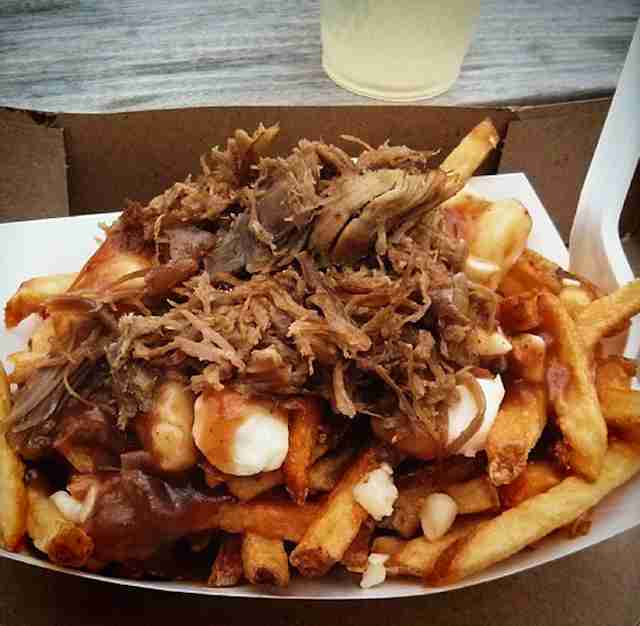 Behold, the duck confit poutine at Lucky's Truck. Made with duck confit, cheese curds, and caramelized onions with balsamic vinegar, all in a red wine and foie gras sauce, the La fameuse is indeed something worthy of fame. Fun fact: "poutine," loosely translated from its native Québécois French, means something along the lines of "big pile of sh*t.” Seriously. It's not meant to be pretty or gourmand, and while we certainly do enjoy those fancy poutines, there's something to be said for a big sloppy mess of French fries covered in stuff, as it was meant to be. Nowhere nails this better than A.A. Restaurant, a locals diner that is open 24 hours and serves massive portions for ridiculously cheap prices. 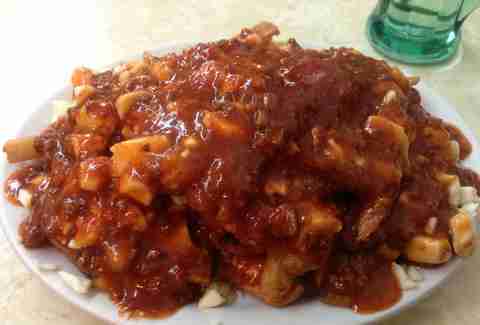 Get the Italian poutine, which swaps out the gravy for bolognese sauce. 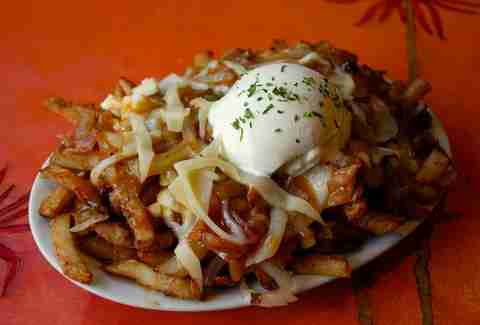 It seems almost inevitable that these two local dishes would combine to form a poutine Voltron. 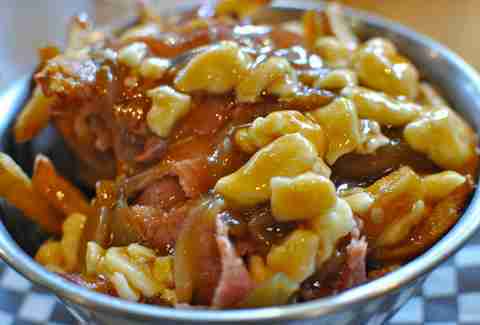 So it stands to reason that you can find smoked meat poutine on the menu at nearly every restaurant that serves either. Mâché specializes in Québec comfort food like poutine and les pâtés chinois (Chinese shepherd's pie) in a cozy café atmosphere, where eating a bowl of poutine piled high with smoked meat ends up feeling like a bowlful of warm hugs. A somewhat new entrant into the pantheon of Montreal poutines is the Pogo poutine -- made with cut up mini corn dogs. We have Québec-based snack bar chain Poutineville to thank for that. So, uh, thank you? It was a happy day when food trucks were once again made legal in Montreal, and an even happier day when Boîte à Fromages - Raclette Express took to the streets with its menu built around gooey, buttery, melty Raclette cheese poured over things, the ultimate in cold-weather comfort food thanks be to the Swiss. 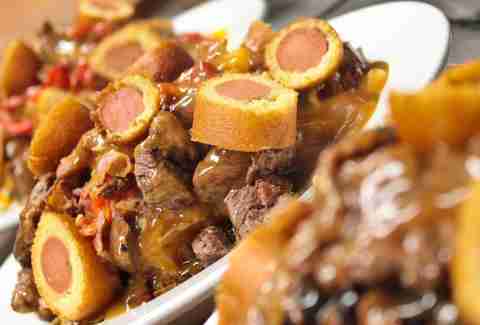 It makes its own version of poutine with Raclette cubes, pulled beef, and caramelized onions in a red wine demi-glace, which is every bit as rich and decadent as it sounds. La Banquise is sort of the grand dame of Montreal poutineries, serving 22 different kinds of poutine in addition to burgers, hot dogs, and breakfast since 1968. With so many poutine options to choose from, it's tough to say which ones stand out as the most unique (and/or weirdest). There's the La Elvis, with ground beef, green peppers, and mushrooms, but our money is on La Savoyarde -- bacon, onions, Swiss cheese, and sour cream. Frite Alors! has eight styles of poutine with 17 different sauces to choose from. While none of us here at Thrillist are mathematicians, we feel confident in saying that's a hell of a lot of possible flavor combinations. If you find that too overwhelming (math! ), then stick with the classic -- La Frite Alors!. 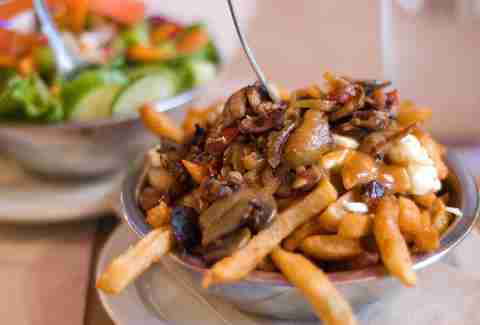 Its signature poutine is made with green peppers, mushrooms, onions, and bacon. So, pretty much someone at Friite Alors! ordered a green pepper, mushroom, onion, and bacon pizza one night and said to themselves, "You know what would be cool to try on a poutine?" The rest is history.